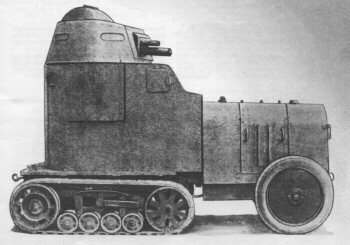 The Samochód Pancerny wzór 28 (“armored car model 28”) or shortened wz.28 was the result of a 1926 specification issued by the General Staff. It asked for a replacement for the aging Peugeot models in service with the Polish army, but also a new kind of vehicle with real off-road capabilities. A commission was sent to France to see the trials of the Citröen-Kégresse half-track, equipped with a new revolutionary light track and suspension system, which already proved successful in two expeditions, in Africa and Asia. 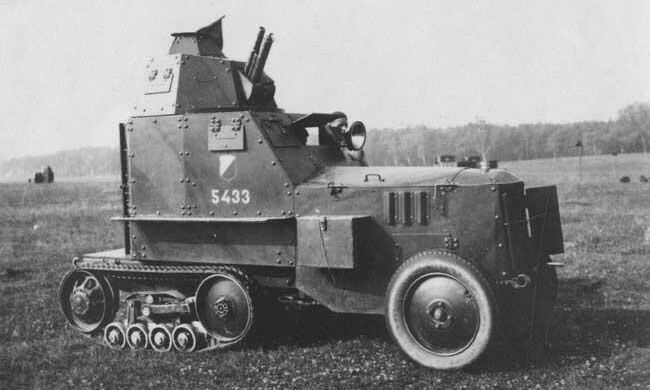 The French army had already produced hundreds of towing trucks equipped with this system, and 16 AMC M23 armored cars had been already delivered for the colonies. Later on, the improved AMC M28 and M29 were largely produced between 1928-1930. The Polish government purchased 135 Citroën-Kegresse B2 10CV chassis in 1924 for conversion at home. Of these, 90 chassis would be taken for conversion into armored cars, loosely based on the AMC M23. Two prototypes were designed by Robert Gabeau (Military Engineers’ Research Institute) and Józef Chaciński in 1925 (CWS workshops), and were heavily tested at the Central Cavalry School. One of these, with modifications, was accepted in 1927 as the basis for production by the Centralne Warsztaty Samochodowe (CWS) workshops in the following years. A first 20 unit preseries batch was produced, heavily tested and modified, until the final model, wz.28, was accepted the same year. Armored plates were produced by “Baildon” Steelworks in Katowice. 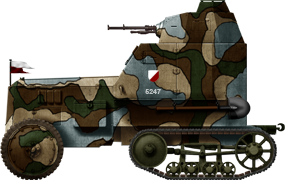 The wz.28, also commonly called “CK” (Citroen-Kegresse), was a high, narrow vehicle, with the driving/fighting compartment located at the rear. It had a fully-traversable octagonal turret on top, itself crowned with a small hexagonal ventilation cupola. The turret could accommodate either a wz.25 standard machine-gun (with 2000/4200 rounds) or a Puteaux SA-18 37 mm (1.46 in) L/21 gun with 96 HE and AT rounds. The SA-18 was a low-velocity, short-range gun meant to deal with light vehicles and fortified positions. It was assorted with a telescopic sight with 1.5x zoom. 30 armored cars would be gun-armed and 60 machine-gun armed. The basic frame structure received riveted rolled steel plates, with 8 mm (0.31 in) thick vertical plates at the front and 3-6 mm (0.12-0.24 in) sloped plates elsewhere, but the bottom remained unprotected. The early type (1928-1929) had a particular hull configuration, but the late type (late 1929 to 1931) received a new hull, shifted rearwards and equipped with rear sloped armor, with the turret still in place. There were small vision slits on the turret and driver armored hatches. Both models had rear and side doors. The engine hood could be opened and there were two small storage boxes on each side of it. The early model also had large mud guards over the tracks and seven observation hatches around the turret (for the first batch). The engine was a Citröen B10, water-cooled, 4-cylinder petrol 1477 cm3, giving 20 bhp @2100 rpm, for a power-to-weight ratio of 115 kg/bhp. Fuel consumption was 20-45 liters/100 km. The fuel tank could hold 59 liters. The transmission comprised a dry single-disc main clutch, assisted by a three-forward, one-reverse gearbox with a reducer. Steering was done by turning the main front wheels (full-rubber tires 710/750×90 mm) and braking one track. Suspensions were leaf springs (forward), and Kégresse type at the rear, with four double small roadwheels on a sprung bogey. There was a front idler wheel and rear drive sprocket. The rubber tracks were 27.5 cm wide. The crew comprised the driver and commander, seated side by side, and the gunner, who sat on a large belt, suspended high between the flanks. A small headlight could be mounted on the left side, just above the driver vision hatch. As no radio was fitted, command signals were performed with flags, in cavalry tradition. 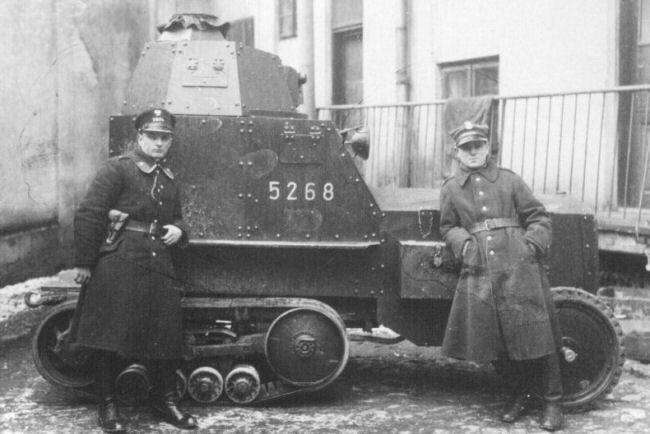 The wz.28 were delivered until 1931, with 30 taken over by training units and 60 others put in operational reserve. 18 cars were used as support for police operations against communist rioters in the Malopolska province. Others were put in several cavalry units for maneuvers, but with many organisation changes. By 1934, they were part of the 2nd and 4th battalions, and the Independent Armored Car Company in Bydgoszcz. From 1935 onward, they were spread among several large mixed armored battalions. By then the wz.28 was considered unreliable. The speed (18.5 mph/30 km/h on average) was insufficient, the track system proved ill-adapted for rough off-road rides at full speed because of the tall structure, and needed to much maintenance; There were stability concerns also, notably the risk of overturning on transverse slopes, and the durability of the rubber tires proved too low. Because of these limitations, all but three (depending on the source) of these models were converted into fully wheeled armored cars with pneumatic tires. 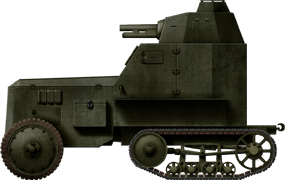 They were taken over for conversion in 1933-34, and were known by the Army as the wzór 34 (wz.34) armored cars. They were the standard Polish armored cars when World War Two broke out. 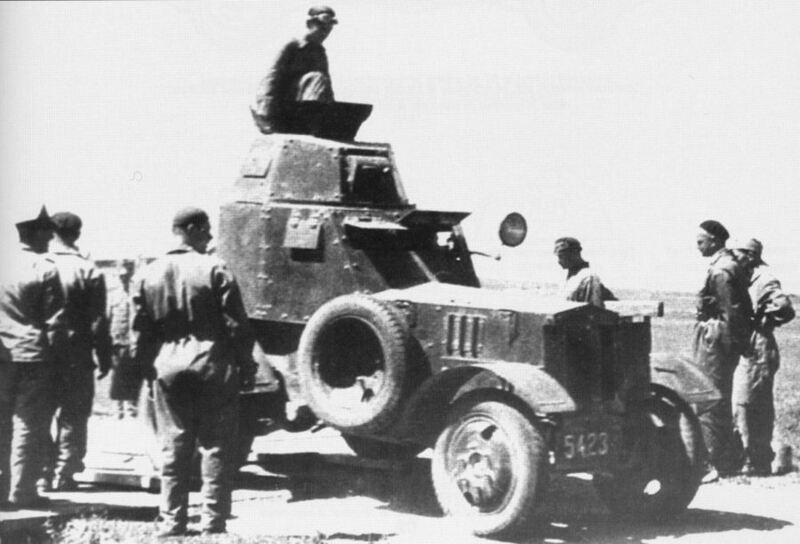 A 1929 wz.28, seen shortly after delivery, during the 1930 maneuvers. The hull was of the early type, armed with the standard-issue wz.25 machine-gun, in fact a licence-built Hotchkiss 7.92 mm (0.3 in) machine-gun. 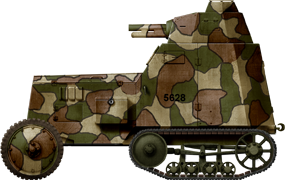 A late-type hull wz.28, armed with the French Puteaux 37 mm (1.46 in) gun, with the 1932 camouflage. Only the last 16 vehicles had this new configuration, of which 9 were gun-armed. 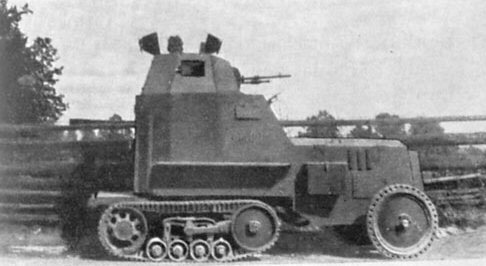 It seems that only three wz.28 were kept in their original configuration by September 1939. They were affected to the Reserve Center Nr.2, an improvised mixed unit commanded by Lt. Feliks Uścinski. They were lost during their withdrawal towards the Hungarian border. The version here shows the possible dark green livery, which was customary at the time.